Such features provide an architectural focal point that you can take with you to your next home. The houseplants are back inside, the pots of annuals have been emptied and the containers won’t be replanted until the spring. But in this rush to lay bare the winter garden, we may be missing an enormous opportunity. Any garden, big or small, can be transformed by the presence of a hardy tree grown in a planter outdoors year-round. The most obvious value of such a feature is that you get a plant of architectural stature where you don’t have soil. A tree in a planter can act as a focal point to the patio or any garden space viewed from a room in the home. Two or three of them can announce your entrance, separate the driveway or provide instant screening on an exposed terrace. In greater numbers, they can turn a hot and unwelcoming area into a leafy grove. But there is a simpler reason for wanting to do this. “A winterberry right out your back door you could look at every morning, that’s pretty spectacular,” said Wendy Gentry, a senior horticulturist at Longwood Gardens, in Kennett Square, Pennsylvania. It probably needs to be a small tree, or a sculptural shrub or conifer. The container should be large and frost-tolerant — no fragile terra cotta. And let’s say right away that growing trees in containers can be pricey, though it doesn’t need to be, and is more demanding than a tree put in the ground. But the results can be fabulous, with an added bonus: Unlike other investments in the garden, you can take it with you when you move. It is useful to think of a tree in a container as a yin-yang pairing: The plant and its home should be matched in size (allowing room for a few inches of root spread), in proportion and in character. The plant is the dominant partner, so the container should not jar in color or form. This isn’t to say it can’t be stylish. 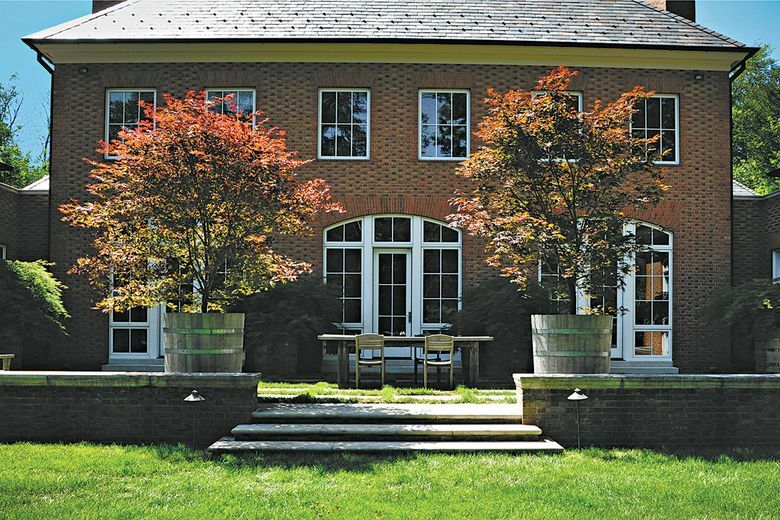 One of the most convincing pairings I have seen is at Eastwoods Nurseries in Washington, Virginia, where owner Henry Eastwood plants varieties of Japanese maples into handmade planters of white oak. They are square and shallow — just 8 inches deep — and angled outward to produce a traylike profile evocative of a bonsai display. Eastwood makes the planters in his workshop. I wondered whether the shallowness of the planters would be a problem for future root growth, but Eastwood, who sells 100 varieties of Japanese maples, said the maple’s root patterns are much broader than deep. “The 45-degree angle is compatible with what the roots do naturally,” he said. However, the effect of putting the trees in such a planter bestows desirable bonsai-like qualities on them: They are stunted and take on an aged character early. And if you want to take the bonsai comparison an extra step, you can also remove the tree from the planter every other year and trim the roots a couple of inches to prevent the tree from becoming pot-bound and to promote new root growth, Eastwood said. 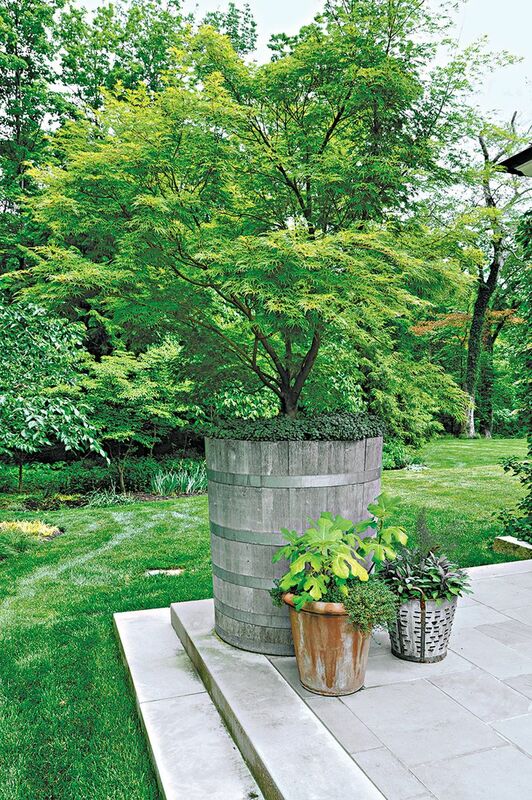 Given its own pedestal, a nurtured maple would, after 10 years, become “an incredible specimen,” he said. If you want more heft in your planter tree, consider the work of professional gardener Nick McCullough, of New Albany, Ohio, who installed full-size Japanese maples for a client 11 years ago, and they are still going strong. He selected two upright maples — purple-leafed Bloodgood and green-leafed Seiryu — and the classic mounded green Viridis, and placed them in large, extravagant oaken containers. The planters are 42 inches across and stand 4 feet tall. They are used to mark key points of entry to the terraces around the house and the tallest, the Bloodgoods, are 12 feet above the pot to create a real presence. Proving that even full-size shade trees will take this treatment, Longwood’s Gentry grows the red maple variety Franksred in large decorative teak containers — Versailles planters — that are 48 inches square and 36 inches high. The trees grow in stainless steel sleeves within the boxes. The planters are just one of several vital elements to consider when cultivating trees this way, along with the soil mix, the selection of varieties, and watering and feeding. Japanese maples (Acer palmatum and A. japonicum) make good candidates for containers because they are relatively small, grow slowly and have fibrous roots. Developed over centuries in Japan, these maples come in many growing habits, leaf shapes and colors. I am partial to upright green-leafed versions (either single trunk or multi-stemmed) over the popular purple-leafed varieties because I find them visually lighter and more textural, and they tend to have spectacular autumn coloration. All types — upright, spreading and weeping — work in the planters, Eastwood said. Whatever variety you pick, deft formative pruning would enhance the effect. But other deciduous shrubs and trees are excellent, too, especially smaller or more compact cultivars. Trees in planters have roots exposed to air temperatures and behave as if they are in colder climates, so you will need to make sure your chosen variety is tough enough. You should shift to at least one plant-hardiness zone colder. For example, the Seattle area is in Zone 8b, so you will need varieties that are hardy to Zone 7 or lower. Containers must have three specific qualities. First, they need to be large enough to allow sufficient root development relative to the top growth and to anchor the tree when the wind blows. Even the smallest trees (except perhaps the smallest dwarf conifers) should have pots of at least 20 inches across. You can undersize the pot if you compensate with diligent watering and feeding, but generally, the larger the pot, the better, because size will minimize the stress of fluctuating soil temperatures and moisture. Second, planters need to be frost-proof and resistant to UV damage. Wooden, fiberglass, cast concrete and high-grade plastic are desirable. Metal may get too hot in summer and too cold in winter. Most (but not all) terra cotta pots are prone to cracking in winter. Third, the planters must drain freely. Most trees will die in waterlogged conditions. A single drainage hole may not be enough, and planters on hard paving should be elevated an inch or so for effective drainage. Do not use topsoil or anything not designed for container use. Even potting mixes should be amended with sharp sand or, better yet, chicken grit because peat moss, wood and bark mulch, and other organic ingredients eventually break down to a heavy soil consistency, impeding root aeration. The soil can be freshened if you decide to root-prune, which can be done by slicing roots where they abut the planter sides. Woody plants in containers will need watering more often than those in the ground, as much as twice a week or more in high summer. Water until the planter drains. Don’t rely on rain to do the job, even in a wet year. You also need to water from October to April to prevent the roots from desiccating. Water every two or three weeks in the offseason but only when temperatures are above freezing. Trees in planters need to be fed regularly, but not excessively. Incorporate a slow-release fertilizer at planting time. Organic options are available, including dried kelp meal. Stop feeding for the year in August to allow the tree to prepare for dormancy. A simple mulch of pine fines, river stones or pea gravel will help to retain soil moisture and thwart weeds. Some gardeners plant flowering annuals or perennials beneath the tree, but that may be gilding the lily. Demure, fine-textured ground covers or even moss would be a more elegant approach.